Bret Michaels appeared on Extreme Home Makeover this past week, much to my coworkers delight. She was describing the episode to me and went on about how she had always had a crush on the Poison front man. She was wondering if he was wearing makeup on the show. Despite the fact that she is hip to the appeal of rockstars she is in her early 60's, an era where Frankie Avalon and Fabian did not wear lip liner and blush. It made me reminisce when I told her, "Why of course he was...I learned everything about makeup from my Poison poster when I was a teen!" This exact poster in fact I had showcased in my room. Right next to the shrine to Nikki Sixx, lifesize poster of Lenny Kravitz and any other guys that would make my dad cringe. 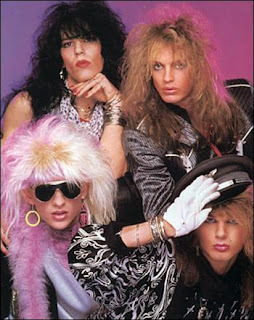 At the time I thought the Poison guys were the prettiest people I had ever seen. Now I am pretty much thinking that their influence probably had me looking like a...well you can fill that in! Well, they undoubtably made your dad cringe! That's funny! Oh the 80's....gotta love them! I watched that episode last week, I thought it was really cool that he was on the show. He seems like a good guy.